Jeff Minter has been making games for quite some time. One of the original arcade masters, Minter and his development team Llamasoft is known for visually overwhelming, trance-inducing shoot-’em-ups. Their latest game, Tempest 4000, is no exception. If you’re unfamiliar with the original Tempest, it’s a stunning little game which sees you surfing down polygonal tubes and beating back waves of Xs — literally. One of the earliest vector-graphics games, it was a technical and visual achievement in its day (and a notorious headache for arcade owners, who faced a never-ending onslaught of Tempest machines conking out on them). 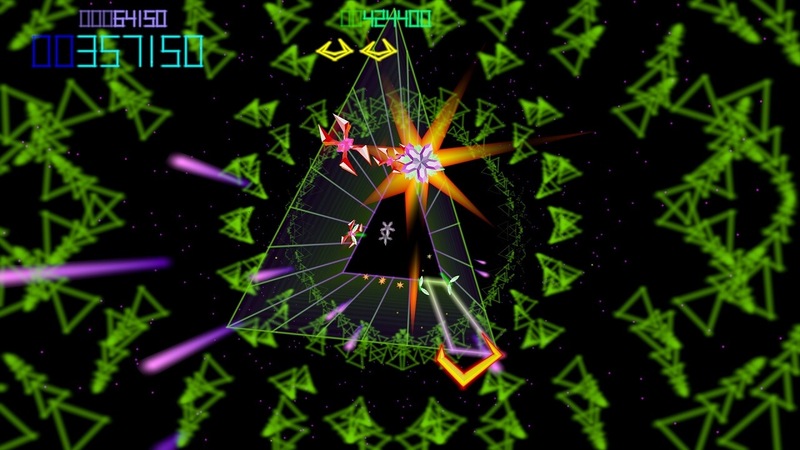 Tempest 4000 is not the first of Llamasoft’s Tempest reworks. That would be the 1994 Tempest 2000 for the Atari Jaguar, which was followed by 2002’s Tempest 3000, then TxK in 2014. Minter’s done a lot of Tempest games. 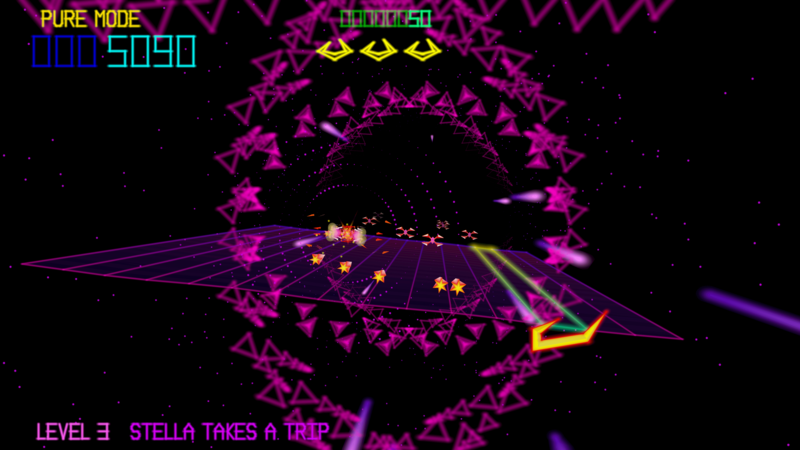 I should fess up now, before I go any further, that I’ve never played Tempest 2–3000, nor have I played TxK. 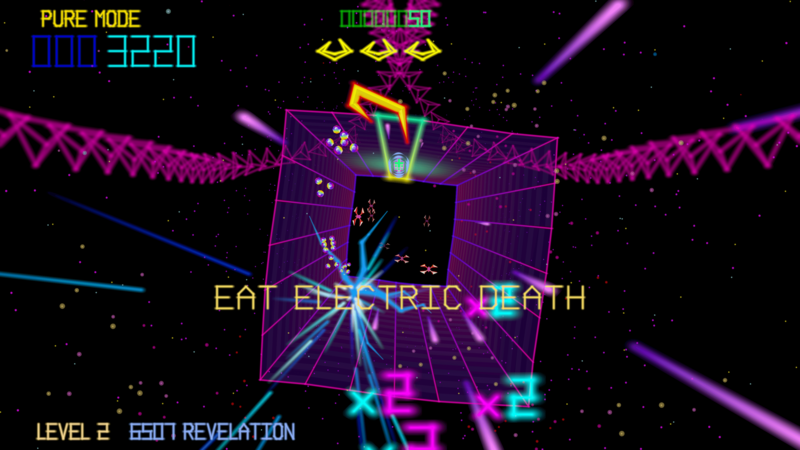 Having done a little digging, it sounds like Tempest 4000 is more or less TxK for more platforms; so if you’ve played TxK, read no further: it’s more of that. But if, like me, you haven’t played any of Llama’s other Tempest reworks, read on. The first thing to note is that Tempest 4000 is not just an HD remake of Dave Theurer’s classic. It’s a whole new game. The core of Theurer’s creation is there –– you play as a yellow claw that flips around on tubes and shoots down Xs (it’s a lot more exciting than it sounds) –– but Llamasoft have added enough new tricks to make the experience feel fresh. The biggest update is that the levels are new. That isn’t a small change –– it’s a dramatic reworking of what the game asks of you. So much of Tempest 1 and 4000’s depth and pacing rely on the evolving geometries of the tubes you inhabit. Enemies tend to cluster on edges, so the size and number of edges determine the spread and size of those clusters. One level is a claustrophobic rhombus that sees you belting across borders and razing the rising dangers. It’s a chaotic, explosion-fogged frenzy that can be hard to parse in the most thrilling way. Another level is a stretched-out ‘J’ shape, which requires careful maintenance of zones. Your ship doesn’t move fast enough to zip from end to end, so you have to stay to one side and beat back the dangers, then shift to the other side before it gets out of hand. It’s a different kind of tension, requiring not reflexes but strategy, and focused awareness. The other big change is the addition of power-ups. In the original Tempest, the guns you start with are the guns you die with. But in Tempest 4000, Minter has added glowing green pluses to the hordes climbing towards you. If you pick them up, you get a boost to your fire rate. This has the potential to make mincemeat out of the baddies and makes aim and precision a total non-factor. Smartly, each level has its own difficulty curve, starting slow and unchallenging before ramping into heart-thumping chaos by the end. Not only does this give a nice tension-release pace to every level, it ensures that at the end of each level, if your gun’s not almost fully souped-up, you’re guaranteed to be swallowed whole by the encroaching army. This adds a thrilling new dilemma to your moment-to-moment decisions. Say you’ve been pretty good about beating back the bad guys, but there’s a large cluster forming a little way away from you. Of course, all you’d have to do is glide over to their zone and shoot them all down, and boom. Taken care of. Only –– there’s a power-up coming to where you are now. Do you stay to get the power-up and risk letting a zone get out of hand, or do you leave the power-up behind, risk letting your gun get underpowered, and keep a lid on things before it all blows up and you get swarmed by enemies? It’s an exhilarating give and take that adds a wonderful new depth to the Tempest formula. There are new enemies, too. I’m sure there are more I haven’t got to yet (it’s quite hard, mind), but of the new enemy types I have encountered, there’s a floating yellow orb that, when shot, explodes violently, warping your screen and unleashing yellow smoke; a disco-ball-looking thing that sends a similar shock through your monitor; and a cube housing Xs that evacuate when their home is obliterated. I’m most enamored with the visuals-altering enemies, as they do the most to add new mechanics and interest to the core experience. And the visuals in this game are spectacular. Minter is known for his dazzling firework displays, and Tempest 4000 doesn’t disappoint. The obvious comparison is that it’s like the trippy light show part at the end of 2001: A Space Odyssey, only it’s not an interlude to something else: it’s just the whole game and it’s forever. Which is honestly pretty great. The peripherals intensify as you get further along, heightening the tension as your score ticks higher and the waves of enemies get harder. It’s beautifully organic in a way screenshots don’t do justice. You have to see the game in action to understand how gorgeous it really is. See how star fields dance and tremble on the fringes of your path, how enemies rupture into gobs of vanishing cotton candy, the way wacky words of encouragement drift over the cloudtops of your view, urging you forward in your descending onslaught. And while the convulsing explosions and technicolored smokescreens certainly make for a cluttered screen, somehow you learn to parse it all out as you drift into ‘the zone’ the genre’s known for. It’s a wonderful feeling. There is, unfortunately, one final thing I should note: if you plan on playing on a monitor with a refresh rate higher than 60Hz, you’ll probably want to cap the refresh rate at 60 while you’re playing. My monitor is 144Hz, which, strangely, caused the game to play at three-times speed. It was basically unplayable (or, at the very least, unwinnable). Capping the refresh rate is pretty painless, though, so I’d urge you not to let that keep you from grabbing the game! If you’ll excuse me, I’ll be going now. I have some space tubes to explore. 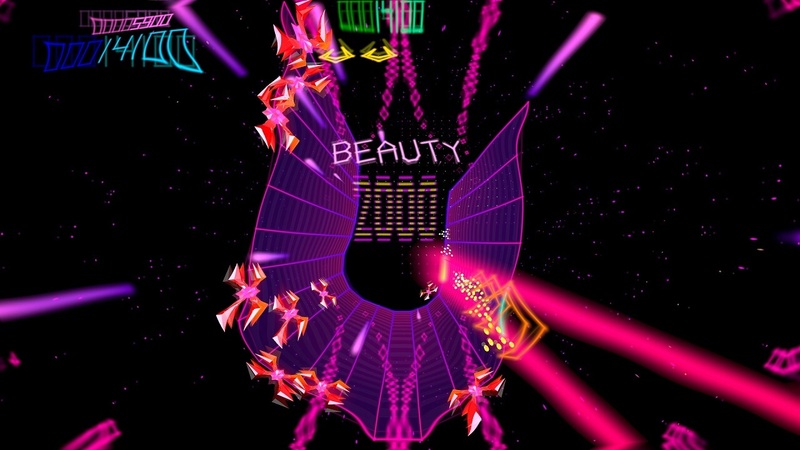 Tempest 4000 is available in all its multicolored glory on Steam, Humble Bundle, PS4 and Xbox One.